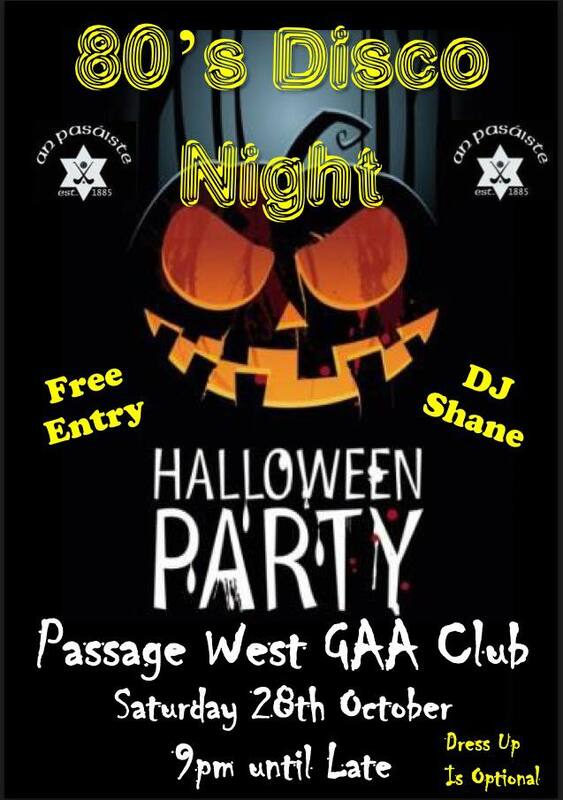 Welcome to the Passage West GAA club website. It’s aim is to promote the club and all it’s activities to all our supporters, wherever in the world you are. If you have any feedback/ideas for us, please contact us through the Teams/Contact page. Thanks to Siobhan Russell Photography from The Carrigdhoun Newspaper for these pictures of the 4th & 5th class inter schools football blitz that was held on May 17th! The Gavin Glynn Foundation t shirts have arrived for the Cork City Marathon, which takes place this Sunday morning. The 2 teams of runners (all Pasaiste Og coaches) will be running this to raise funds for the Gavin Glynn Foundation & Pasaiste Og. Good luck to all of our players who are making their first communion in Passage and Monkstown on this Saturday Morning. We hope hat the sun shines and that everyone has a super day! The remaining 2 workshops are being run together at Passage West GAA club on March 26th now, as the 19th is a bank holiday. This workshop is being given by Rebel Óg GDA’s. If you can attend the workshop that links to your teams age bracket please do so. The workshop on the 26th will start at 7.30pm & run for 2.5 hours. It’s Silver for Pasáiste Óg from Rebel Óg this year! The Pasáiste Óg section (5-12 years of age) of Passage West GAA club are delighted to announce that they have moved the club forward from Bronze to Silver accreditation, under the Rebel Óg Benchmarking Coaching Vision 2020 Programme for the work they completed in 2017. Moving from Bronze to Silver in consecutive years is quite rare, so this is a huge achievement by everyone associated with Pasáiste Óg. First of all, we would like to thank every child, parent, helper, and coach, for the hours spent attending training & matches, setting up the clubhouse for during/after the blitzes & for organising the Healthy Eating initiatives during 2017. Without you we could not do what we do! What is the Rebel Óg Benchmarking Coaching Vision 2020 Programme? Rebel Óg Coaching Benchmarks 2020 were successfully launched in early 2015 and provide a template for best practice in coaching, promoting maximum participation and optimal playing standards in juvenile clubs throughout Cork city and county. The programme includes minimum requirements for entry, with subsequent progression to Bronze, Silver or Gold targets, which clubs would strive to achieve with the assistance of their local GDA. Bronze criteria are based on establishing a primary school coaching and games programme in schools within a club’s catchment area. Silver criteria are based on an appropriate programme of club coaching and games for 5-12 year old’s, while Gold criteria are based on appropriate coaching and games for 13-18 year old’s. The programme in each club is overseen by the local GDA Paudie O’Brien, and organised countywide by County Coaching Officer Kevin O’Donovan and Games Manager Kevin O’Callaghan. What did Pasáiste Óg do to achieve Siler in 2017? Award Level 1 – Jan 11/18/25th 2017, given by Paudie O’Brien, GDA. 18 coaches attended. Alan Keane (chartered physio, club member & player, Cork Con physio) - Injury Prevention Workshop – Feb 4th 2017. Child Protection Course night 2 – March 27th – given by Traolach O’Ceallachain. In total 35 of our coaches attended this course on either night. National Schools Coaching Sessions provided for National Schools Coaches – given by Paudie O’Brien in Passage – May 9th , by Kevin Murray – August 23rd, by Colm Crowley – September 8th. Under 11 football X 12 games played, including hosting John Kerins blitz in Passage, and hosting their league finals at Passage. Under 12 football x 7, reached Quarter finals. Presentation to members of the Naval Service – In recognition of their Humanitarian duties – March 24th. Give Respect Get Respect Initiative Launch – March 24th, attended by Kevin O’Callaghan, Rebel Óg. National Schools Coaching Programme Launch @ Murphy’s Centra Rochestown – May 15th, attended by Paudie O’Brien, GDA. Presentation to 4 local National Schools @ our annual 1st Class Harbour Parishes Football Blitz – May 17th, attended by Paudie O’Brien, GDA. Presentation to Terry Murphy, owner Murphy’s Centra, July, at annual Golf Classic. Awards night held at our club on December 2nd for the victorious under 9 & 10 football & hurling teams, to be attended by Cork hurlers Robbie O’Flynn & Shane Kingston. Annual 1st Class Harbour Parishes Football Blitz for 150 kids from the 4 local national schools – May 17th. Passage West GAA club organise & pay for busses to transport the kids from 3 of the schools to our club. UK/IRISH schools football blitz held on June 2nd at Passage West GAA club attended by a London school, St John Fisher from Harrow. The 4th & 5th classes played against Star of the Sea & Monkstown National School. Finally, as we now set the Gold Standard firmly in our sights, what do we need to do to achieve this? First of all, Gold covers ages 6 to 18 (Bronze & Silver covers from 5-12). Junior A Footballers win the McSweeney Cup. Congratulations to to Passage Junior A Footballers who beat Delaneys this morning to win the Mc Sweeney cup. 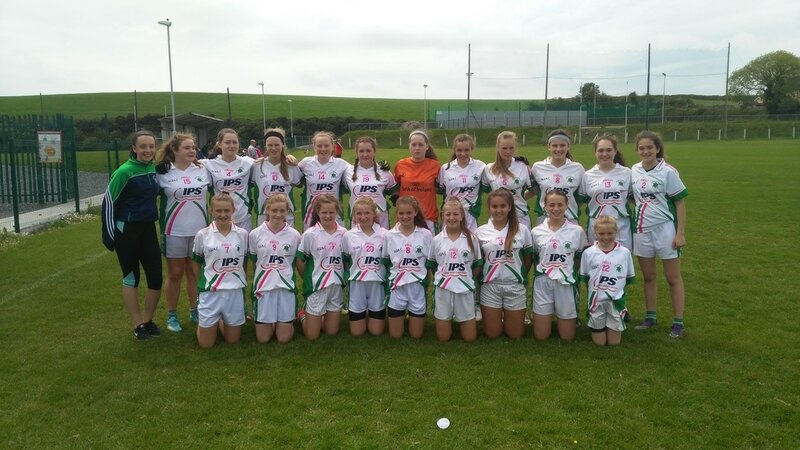 ​Well done to the U14 girls who won the Mid Cork Autumn League this afternoon beating Macroom in their final match. Congratulations girls!! The Juvenile Section AGM will be held on Tuesday November 28th at 8pm. The camogie club are having a coffee morning on Friday 22nd Sept at 10.30am in the club to raise money for a set of jerseys.Please come along and support them! Passage West GAA club would like to offer their sincere condolences to Andy & Phillip Heavy on the very sad loss of Caroline this morning. You are in our thoughts & our prayers. Caroline's removal will be at 7pm this Tuesday to St. Mary's church Passage. The clubhouse will be open after the removal at the family's request. Funeral at 2pm Wednesday. Passage were too strong for Ballygarvan on Friday night, and probably should have won by more but for going for goal too much in the first half instead of putting the ball over the bar - but Niky Lyons (2), Brendan Calnan and Keelin Collins got good goals to leave the halftime score 4-0 to 1-0 to Passage. The lads rectified the points situation in the second half - scoring 2-7. There were strong performances in every line, from Mark Tiernan in goals to Conor Hanlon as target man up front. Niky Lyons (2-2), Ronan Byrne (1-3) and Brendan Calnan (2-0) led the scoring and they were well supported by Keelin Collins (1-0) & Charlie Lester (0-1) at Centre Forward & Midfield who both had a hand in every attack and score. Some of the scores taken were of the highest quality - especially from Ronan & Niky from Wing Forward - while Keelin and Dylan in particular covered every blade of grass. Dylan Barrett was his usual dominant self at Centre Back, on Ballygarvan's big dangerman. Mark Lester controlled it all at the back with Alfie O Connell and Cian Gill while Sam O Brien (0-1) had his best game in a Passage jersey - getting the score of the game with a great point after a barnstorming run. Kristian O Callaghan looked like he's been playing all his life in his first ever Gaelic Football match. Noah White had a hand in several scores throughout and Noah Sowinska set up numerous attacks from half back with simple accurate passes every time he got possession. Conor Hanlon was like a ball magnet at Full Forward and his hand passing distribution was fantastic. Brendan Calnan poached 2 goals in flashes that the defenders never saw coming. Mark Tiernan hit his target from the vast majority of his kickouts and set the team on the attack again and again. Strong performances all over the pitch showed there's more to come from these boys, especially as 5 of them are Under 11 as well. Wishing the very best of luck to Rachel Sheehan and the Cork U16s in the All-Ireland Final v Galway this Wednesday 26th July. Throw-in at 7pm in Nenagh. ​Hard luck to Rachel Sheehan and the Cork U16s who were beaten by a strong Galway side this evening in Nenagh in the All-Ireland Final. A fantastic achievement to be representing your club and county at such a high level Rachel, well done. 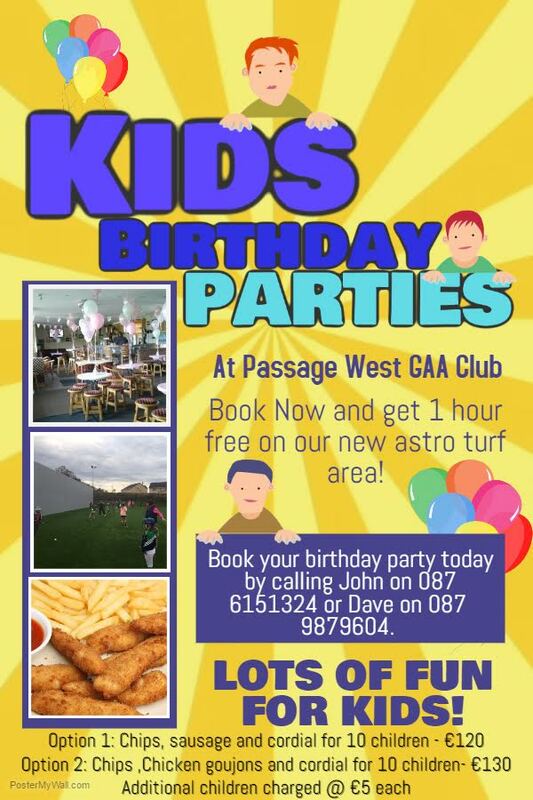 Book your Childrens Birthday at Passage West GAA Club today! Rebel Summer Camp a huge success as Cork senior hurlers get involved! ​The Rebel Club Camps took place in Passage West GAA from the 17th-20th of July. It welcomed all Boys and Girls from the ages of 5-14 to come up and join in on the fun, whether they played hurling or football or not. 76 boys and girls were coached by current Cork hurling stars including Mark Coleman, Shane Kingston, Darragh Fitzgibbon and Robbie O'Flynn for the week. It gave everyone a great opportunity to enhance their skills and learn from the young men at the top of their game! A special thank you to all involved in organizing the summer camp! The Junior Ladies had a great win this evening over Erin's Own at Manning Park in the first round of the championship. 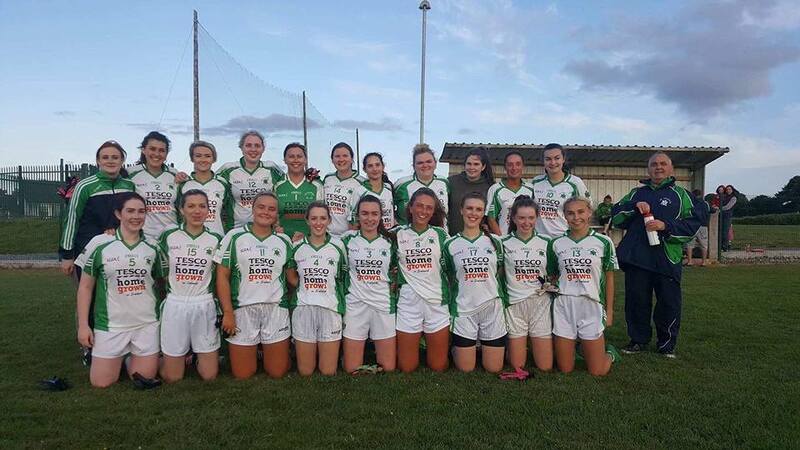 Having suffered defeat the hands of the Glounthaune side last year at the same stage, the Passage girls were determined to make amends and did so in style. Passage took the lead early with a point from Emma Harrington and a goal from Carolyn Mullane, a lead they never relinquished. Erin's Own responded with a couple of scores but Passage went in at the break 2 point ahead. Erin's Own brought Passage's lead down to the bare minimum during the second half but a goal from Emma Harrington, some well worked points and outstanding defending from the Passage backs ensured they ran out deserving winners on a scoreline of 2-4 to 0-8. A great display and a great start to the championship. Next up for the Juniors are Araglen Desmonds Bui. Thanks to all supporters. 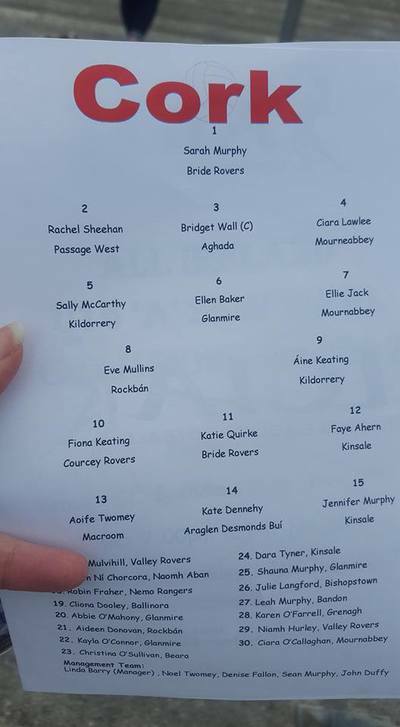 Passage team: Elaine McCarthy, Aoife O'Flynn, Kate Dorgan, Kelly McGranaghan, Louise Walsh, Tia MacMahon, Aoife Allen, Laoise Heffernan, Ria O'Mahony, Emma Harrington, Amy O'Neill, Chloe McCarthy, Eimear Dorgan, Carolyn Mullane, Anna Horan, Katie Atkinson, Michelle Moriarty, Linda Gleeson and Lisa O'Sullivan. 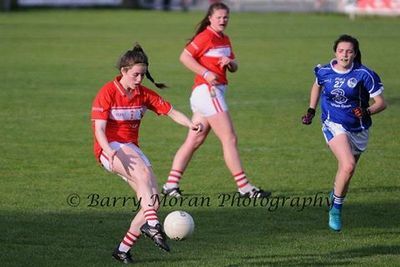 ​Huge congratulations to Rachel Sheehan who had a fantastic game at corner-back for the Cork U16s in their 3-16 to 2-10 victory over Cavan in the All-Ireland semi-final this evening in Birr. ​Cork will play Galway in the All-Ireland Final on Wednesday July 26th,time and venue TBC. Well done Rachel, we are so proud of you. The Under 14 Girls Football team are playing the County Final this Saturday in Bishopstown at 8pm against Mayfield. Please come along & support this fantastic team! 1st Class Harbour Parishes Football blitz - Wednesday May 17th. Passage West GAA club held their third running of the annual 1st Class Harbour Parishes Football blitz on Wednesday May 17th. Despite one heavy shower, this blitz was another big success for our club, with the boys & girls showing some great skills out on the pitch. The 4 schools, their teachers & SNA’s. Kevin Barry – for his prowess as a photographer! The 2 Garda Busses & drivers. Billy Delaney (former player) for organising the large bus. All of the Passage West GAA club volunteers who gave up their time this morning. What a great club we have, what great people we have working to make this club what it is, and also putting in the hours to drive the club forward continuously. We should be very proud of this morning! Johno for having the clubhouse ready for us – sorry about the grass! Paudie O’Brien – our Rebel Óg GDA, getting very familiar with our club lately! Christopher Joyce, Cork Senior Hurler, for turning up to watch the action. Good luck on Sunday Joycey! Finally, a huge thank you again to everyone at Murphy’s Centra Rochestown for very kindly sponsoring the food & drinks for all of the kids. Your sponsoring of this event & our National Schools GAA Coaching Programme are very much appreciated. On Monday May 15th we officially launched our 2017 National Schools GAA Coaching Programme at Murphy’s Centra Rochestown. Murphy’s Centra are very kindly sponsoring our National Schools GAA Coaching Programme throughout the current school year & into the future. We have 4 young GAA coaches coaching boys & girls in Star of the Sea Passage & Monkstown National School on a weekly basis since early April, coaching every age group in the schools. In any given week this could involve up to 26 hours of coaching being carried out by Passage West GAA club coaches between both schools. This is a major development in our club & is only the start on our road to continuous improvement year on year. All 4 coaches (3 male, 1 female) range in age between 19-21, are all in third level education, and all play at the highest level in our club. Passage West GAA club will be holding their annual Cúl Camp from August 21st to August 25th 2017. · The camps are structured so that a different aspect of the game is worked on each day. · The programme involves coaching specific skills of the game and provide the opportunity for children to put into practice what they have learned through small sided games. Look what just arrived at Passage GAA Club! 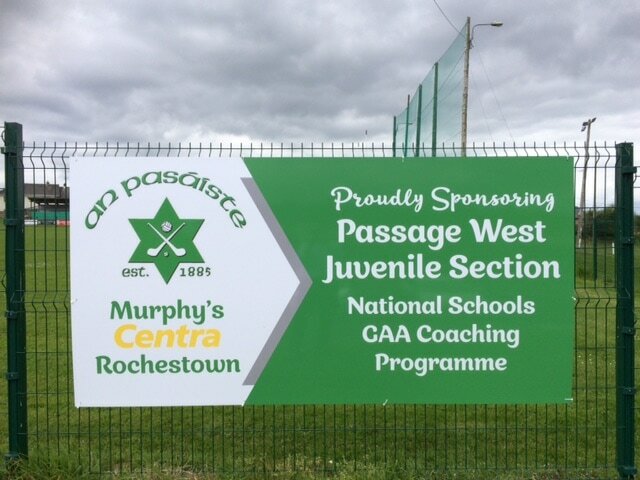 Passage West GAA Club Juvenile Section are delighted to announce that Murphy’s Centra Rochestown have very kindly agreed to sponsor our 2017 National Schools GAA Coaching Programme. As a club we are extremely great full to Murphy’s Centra for agreeing to make this significant contribution to the further development of the underage section of our club. We would like to sincerely thank Terry & Sieglinde & Mary for supporting us on this, as the Juvenile Section of our club takes a very big step forward. Our National Schools GAA Coaching Programme will take place in Star of The Sea Passage & Monkstown National School on a weekly basis. In total there will be between 4-5 male & female coaches in place between both schools, coaching boys & girls from the different classes. All of these coaches are currently playing for our club at the highest level & are also in 3rd level education. It is a pre-requisite of the Juvenile Section of our club that all Juvenile coaches complete the official GAA Child Protection Course, sign up to our Coaches Code of Conduct, and complete the Garda Vetting Process.